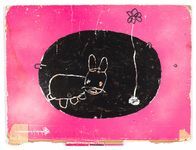 grayDUCK Gallery is pleased to announce an exhibition by Austin artist W. Tucker. 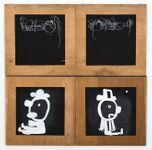 Using his non-dominant hand, Tucker, creates childlike line drawings on found, tattered surfaces such as book covers, scraped lumber and odd bits of paper. Tucker was awarded Austin Critics’ Table Award for “Best Installation” as well as “Artist of the Year” for his installation at Texas State University in 2012. He has been represented in the US by galleries in Los Angeles, Seattle, Wyoming, Dallas, Houston, and Austin. The work begins unplanned. 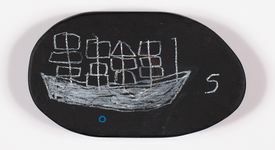 Line drawings, markings, painted strokes and scribbles are made with numerous mediums including oil, lumber stick, resin stick, charcoal, graphite and ink. I work on either simple wood panels or choose from a collection of found materials – old tabletops, cabinet doors, wood blocks wrapped in canvas, and old book covers. The drawings/markings are created with my non-dominant hand. The use of my left hand allows me to draw in an unpracticed manner, with less control and intention, and without forethought. More recently the work has expanded from 2 dimensional work to installations that include wall drawings, books, and standing boxes. The wall drawings are transient, painted over when the installation is dismantled, having a beginning and an end. Books are either created or have been adapted from existing books – images are either added to the pages, or pages are removed and new pages are stitched in. 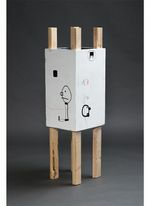 The boxes are an exploration of the work in 3 dimensions, of interior and exterior – a comment on what we present to the world and what we may choose to hide. Over time I have realized that in the finished work I see aspects of our human condition – vulnerability, frailty, kindness, anger, frustration, humor, curiosity, and relationship. As well as glimpses of stories, moments, dilemmas that may represent how we approach or walk through life.